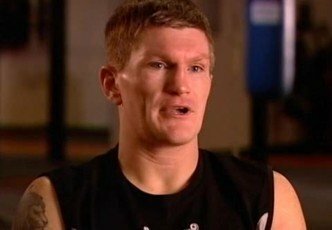 By Michael Collins: Former two division world champion Ricky Hatton (45-2, 32 KO’s) will be making his long awaited comeback on Saturday night against Vyacheslav Senchenko (32-1, 21 KO’s) at the Manchester Arena in Manchester, England. Few fans are expecting Hatton to be at his very best for this fight. After all, he’s lost 5 stone [70 lbs], and he honestly hasn’t been in a real fight since November 2008 when he beat Paulie Malignaggi by an 11th round TKO. Hatton did fight Manny Pacquiao in May of 2009, but Hatton was blown out so quickly in that fight that he barely had time to throw a handful of shots before he was taken out by a prime Pacquiao. I don’t know if I agree with that. Hatton looks older, not as quick or as powerful, and his reflexes seemed to have taken a big hit. Granted, Hatton didn’t look good against Pacquiao, partly because of his wild approach to the fight, but also because he dropped a lot of weight before taking the fight. Hatton looked weight drained for that fight. However, he lost that one largely because of his primitive approach to the bout. Instead of fighting in a controlled manner, Hatton fought like he usually does by throwing leaping left hooks that gave Pacquiao all the openings he needed to KO him. Hatton can probably still beat Senchenko just on 50 percent of what he used to be, because Senchenko isn’t all that special. His loss to Malignaggi showed you where he’s at and it’s pretty interesting that Senchenko was able to win a title and hold down an unbeaten record with his marginal ability. Hatton won’t need much to beat Senchenko nor will he need a whole lot to defeat Malignaggi in a rematch next year. Hatton doesn’t have a lot of desire to fight beyond just two fights, so he might be able to win these two fights and go into a permanent retirement without getting knocked out again.